Roksan Caspian FR-5 review | What Hi-Fi? If you want your new speakers to look every penny of the money you paid for them, pick the Roksan Caspian FR-5s. Tall cabinets in a none-more-glossy, none-more-black finish, they look every inch an expensive pair of speakers. They require a little pampering beyond the occasional flick of the duster. Positioned anywhere except out in plenty of free space they can become fractious, and there's a substantial period of running-in to be endured before the FR-5s are ready to give of their best. The Nowtet's hair-raising take on Whole Lotta Love shows the FR-5s to good advantage. A wide, deep soundstage coupled to fine stereo focus is a great start, and the Roksans summon heroic levels of drive and attack. The dynamic peaks and troughs are described promptly and in full, and there's plenty of detail on offer during the more contemplative moments. Throughout, the FR-5s remain composed and controlled. At the bottom of the frequency range, the Roksans punch manfully – though without quite the agility of some rivals. A switch to Pigmeat Markham's Here Comes The Judge confirms all those traits, and exposes a few new ones. The FR-5s can go very loud indeed without becoming abrasive or letting slip control, and their sheer musicality is prominent. But the Caspians are by no means the most transparent in this category – they flavour your music to their own recipe. Whether you like it or not is down to personal taste. 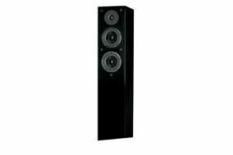 The slightly monotonal bass is in evidence again, and the prominence of the midrange could become problematic if the speakers are poorly partnered. As ever, it's a question of preference. There's no doubt the Roksan Caspian FR-5s have a lot going for them beyond that glossy black finish – they're an energising, musical listen and heavy hitters to boot. Others, though, offer great transparency and low-end modulation – and that's where we'd spend our money.